An SSL connection certificate needs to be changed because e.g. it has expired. Access to AdminClient is required. Firstly, log into the AdminClient. Now open theBasic configuration. Open the configuration menu using the Change button. And then open Expert mode. The currently saved certificate is now visible here. All of the certificates that can be used by Password Safe are displayed here. Therefore, they have to meet the requirements specified under SSL connection certificates. If no CA is available, you can also use your own self-signed certificate. It is important to note that it will need to be distributed after it has been changed on the client. Further information is available in the section certificates. 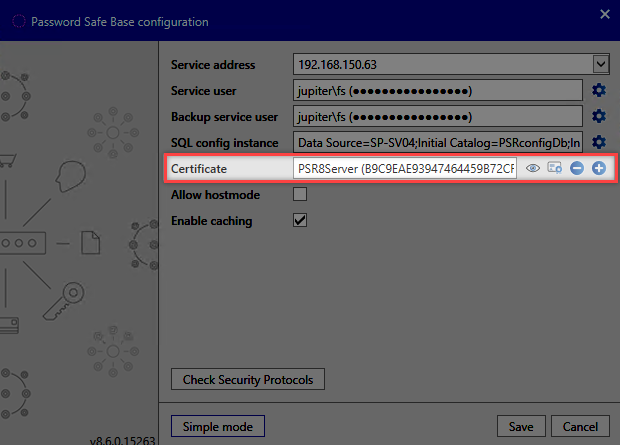 *In versions 8.0.0 to 8.2.0, the certificates were created with a validity of one year and thus they can expire. If you want to replace an expired certificate, you should firstly update to the latest available version. The certificate will then be valid until the year 9999 and is thus valid almost indefinitely.